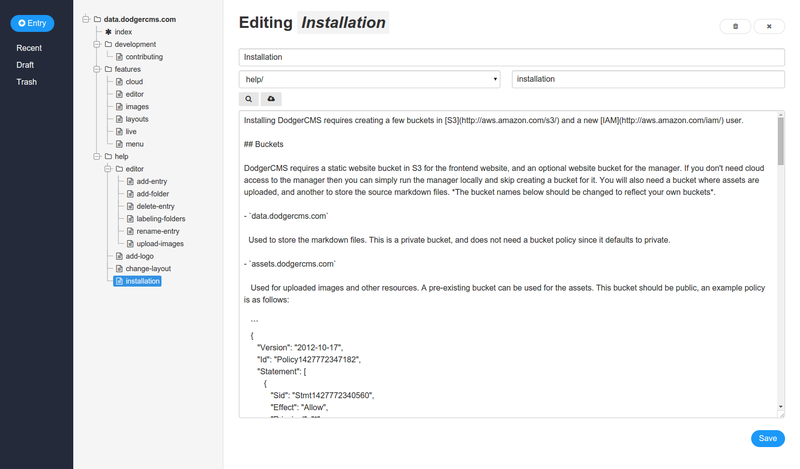 DodgerCMS is a static markdown CMS built on top of Amazon S3. It is a clean and simple alternative to heavy content management systems. There are no databases to manage, deployments to monitor, or massive configuration files. Just focus on writing your content and the results are live immediately. The only requirement for DodgerCMS is an account with Amazon Web Services. It is well suited for small blogs, documentation, and any static website that benefits from the simplicity of markdown. Content is uploaded into the manager and then converted to HTML each time the document is updated. 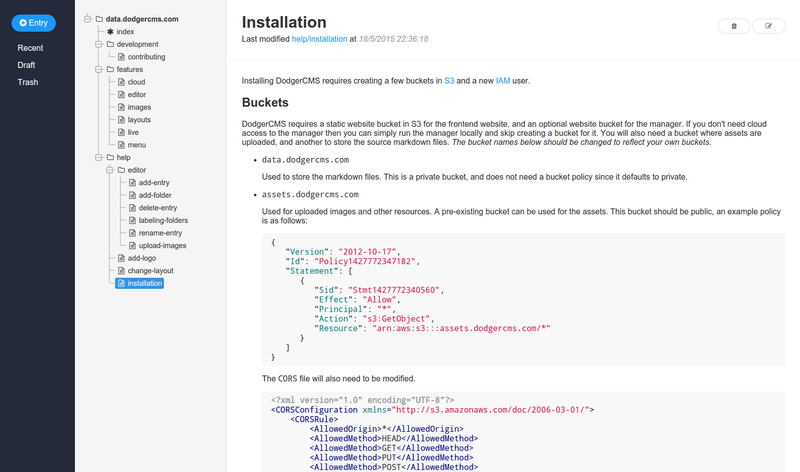 DodgerCMS also keeps a data JSON file with up to date URL's for each entry that can be used to build a menu system. A federated token is created from a user with enough credentials to access the buckets in s3. This token renews every 36 hours, if the access key and secret are stored in local browser storage. For more information see here. How does the menu work? Is DodgerCMS right for my project? Depends. If you have a lot of markdown content that you need to organize, and don't need any database management then DodgerCMS might be a good fit. If you need search or anything complex than something like CraftCMS might be a better alternative. Can I set up SSL? Sure, but it needs to be setup with Amazon CloudFront. There is a good article on how to set that up here. I wanted to see if it was feasible to use S3 as a CMS, and I like working on projects like this for fun. Can I change the styles on the front end? Absolutely. All the styles and the layout are located in in a single file. For more information see here. Does DodgerCMS support any type of search? Not at this time. I've been looking into this to see if using AWS Lambda with DynomoDB might be a solution.